James Taylor may have had his international playing career cut cruelly short, but England believe he can still play a big part in the development of the next generation of stars. That is why the former Leicestershire and Nottinghamshire batsman has been invited to share his experiences and expertise with the Young Lions at their training camp at the National Cricket Performance Centre in Loughborough this week, in a squad that includes 18-year-old Jack Blatherwick. England have already appointed Durham captain Paul Collingwood and Sussex bowling coach Jon Lewis to the coaching staff for the Young Lions programme this winter, which includes a three-week trip to Dubai before Christmas followed by the challenge of a tour of India in the New Year. The involvement of Taylor completes a trio who share exactly 350 international caps – and that’s before adding the wealth of experience of full-time ECB coaches such as Graham Thorpe, Peter Such and Bruce French. Andy Hurry, the Young Lions head coach, explained: “This week’s camp is the first opportunity for us to have contact with the players this winter leading into the series in India. “One of our fundamental aims is to introduce them to the challenges of playing cricket in the sub-continent, and James Taylor is the ideal man in that regard. “Titch is just coming out of the international game, so he’s very current. We’re going to have a question and answer session for him to share his experiences regarding playing and touring in the sub-continent with our group – a chance for them to ask him how he may have had to adapt his game to be successful. “He’ll also be involved in our session on batting against spin led by Graham Thorpe and Paul Collingwood. Having just returned from Bangladesh with Colly, I had an opportunity to see how effectively he works with players, so I’m really excited to have him with us. Hurry relished his experience of the senior England set-up during their one-day series in Bangladesh and is keen to share that knowledge with the Young Lions squad, in which 10 counties are represented. 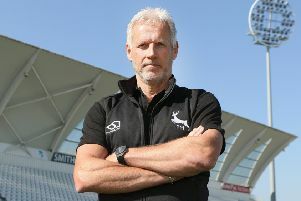 Hurry is unique in having made two coaching trips to Bangladesh with England this year, having led the Under-19s to their World Cup in February.